Indonesian layer cakes are decadently moist, gloriously buttery and wonderfully aromatic. These layered butter cakes are loved for their richly sweet and spiced-infused flavours, and often tinged with dashes of liquor – rum or brandy being the usual favourites! 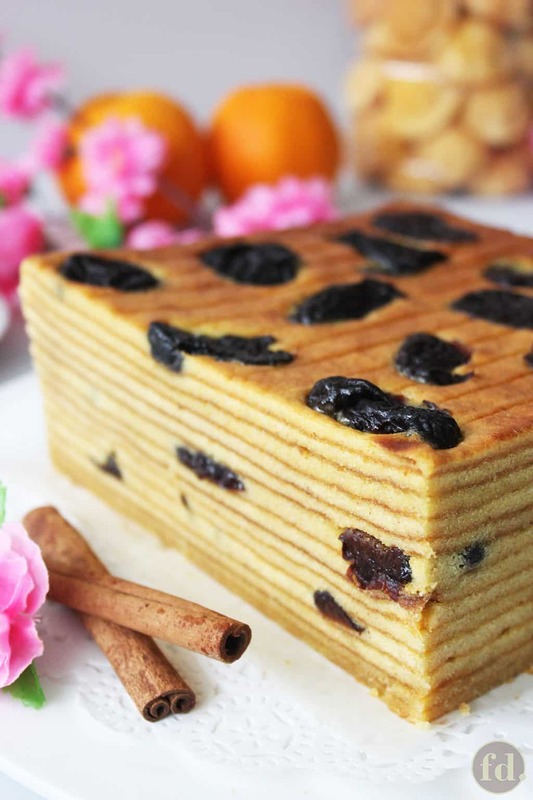 Here, these cakes are given a fresh twist by layering dried fruit, such as dried prunes, in between the many layers. 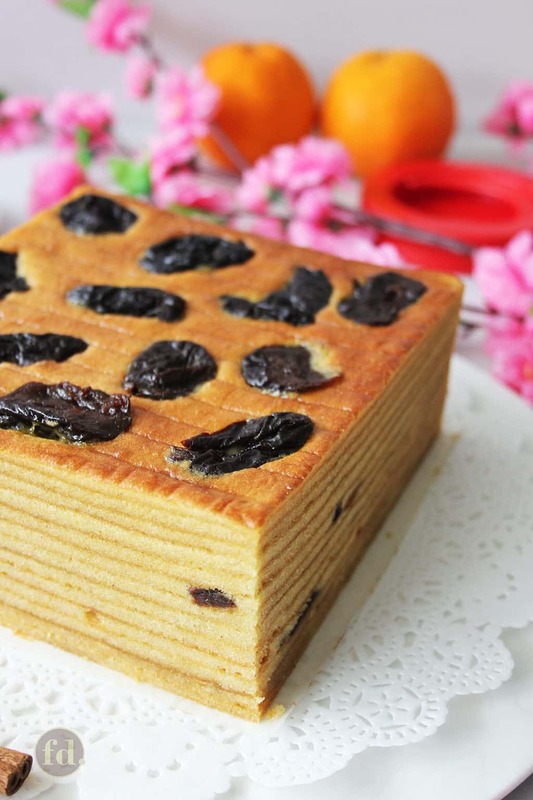 Just two days to go to the Lunar New Year, and I’m posting this recipe for an Indonesian prune layer cake at the eleventh hour! Oh, the sin! I know, I know! This post should have come days, if not weeks, sooner, but it’s been sheer craziness at home. That’s because round about this time every year, I take the ritual of spring cleaning to a whole new level, dare I say, bordering on obsessive-compulsive? You get me, right? I know you do. Which meant, something just had to give – either my obsessive house cleaning or compulsive baking of CNY goodies. The former prevailed. So here I am. Last minute. Now, if you just happened to still have time to squeeze in one more bake, make it this prune layer cake! In fact, you’ll just need 3 hours or so – an afternoon when you can just hover by the oven, and build up this beauty, one layer at a time. It’s not difficult, only just soooo time consuming, but enormously fulfilling when you’ve finished one. In fact, even if you don’t intend to bake one, just go ahead and pin this recipe right now, for next time! 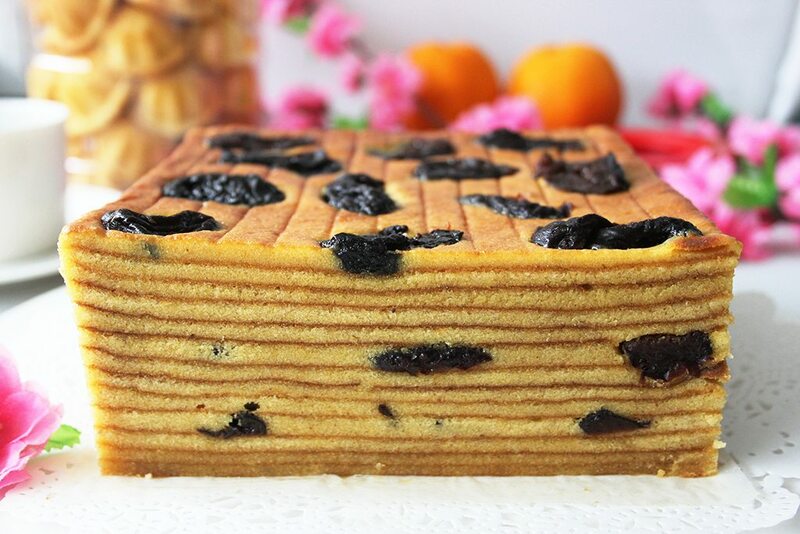 I’ve only just realised as well that my first post every year for the past two, has always been about a layer cake (there was this Indonesian durian layer cake last year, and if you love the classic version, here’s the traditional Indonesian layer cake a.k.a. Kueh Lapis Batavia I baked two years ago). Who knows, this could be the start of a blogging tradition for me, hah! The thing is, I only ever get to bake these layer cakes once a year. With more than two dozen egg yolks, almost two full slabs of butter, and generous amounts of sugar as well to boot, it’s really not a cake my family consumes even occasionally, because we just can’t afford the copious amount of calories from all that fat and sugar. You know how these days, you’d have to fork out a tidy sum of money just to get a respectable loaf-size lapis cake (and the prices keep inching up every year! ), so gifting homemade ones are a lovely thought and gesture. These layer cakes are such a labour of love that they’re always well received and deeply appreciated, and of course, because these spice-scented cakes taste so rich, moist and buttery. Of course, we’d expect nothing less! Okay, no time to lose. I’m making this post as concise as I can so that you can hit the ground running. Have all your ingredients at room temperature. Eggs at room temperature will incorporate more air when whipped, than when cold. Butter should be just softened, and yield slightly when pressed lightly, but not too soft as to feel oily. Ideal temperature to have butter at is 19 deg C, for optimal creaming. Take your time and be sure to cream till the butter feels light and fluffy on your spatula. Place cake pan right in the centre of the oven. If cake pan is placed too far down from the top heat, it will take much longer to brown the layers, and the extended grilling may dry out the layers. The layers are fairly thin, so it’ll only take a matter of a couple of minutes to cook. It’s the browning that takes up the extra time. Brown each layer adequately to a nice golden, even deep brown, just don’t burn it. The darker the toasted tops are, the more vivid the layered pattern will be, and also, that much more flavourful! Try to achieve a fairly reasonable thickness for each layer. Too thin and the layers may run the risk of drying out and browning too quickly (and burning! ), unless you’re ready to plomp yourself on a stool right in front of your oven door and watch it like a hawk. Too thick, and you’ll have less layers to your cake, though that’s totally OKAY. I usually try to aim for anywhere between 10 to 12 layers, or about a 5-mm thickness per layer. Remember to conscientiously prick each cooked layer with a fork, just in a few places across the layer. This will help minimise, though not necessarily prevent, trapped air from ‘ballooning’. If you see air bubbles forming as the layer bakes in the oven, don’t worry! Just open the oven door, quickly yank out the pan, prick those bubbles with a toothpick, and return it to grill. Pressing lightly with a lapis press or fondant press also helps to prevent air pockets from building up as you add on each layer. It also helps create a nice and tight pattern, but just don’t apply too much pressure, or else the cake will end up shorter and dense. Adjust your oven rack, moving it down a level, if necessary, for the last 2 to 3 layers. That’s because as the layers build up, the top gets closer to the top heating element and will brown very, very quickly! I’d like to take this opportunity to wish each and everyone of you, my dear readers, a Happy Lunar New Year! May your year be smooth sailing, and be blessed with good health, peace and prosperity! Thank you very much for your loyalty and support over the years! Grease the sides and base of an 8-inch square cake pan and line the base with greaseproof paper. Set your oven rack right in the centre of the oven. Pre-heat oven to 200 deg C (390 deg F). Sift the flour and mixed spice together into a mixing bowl. Set aside. Reserve some prunes for topping the cake. Using an electric mixer fitted with a paddle attachment, beat butter with condensed milk on medium speed (speed 3 on my Kitchen Aid mixer), until light and fluffy, about 10 minutes. Set aside. Switch to the whisk attachment. In a clean mixer bowl, whip whole eggs, egg yolks, sugar and sponge gel (Ovalette) on high speed (speed 5 on my Kitchen Aid mixer) until mixture turns pale, becomes thick and fluffy, about 7 to 8 minutes. Now, switch back to a dry and clean paddle attachment. Reduce mixer speed to low (speed 1 to 2). Add the flour mixture to the egg mixture and beat until just combined. Maintaining low speed, add butter in 3 batches, beating well after each addition. Heat the greased cake pan in the oven for 2 minutes. Set the oven to grill (or broil) mode. Scoop batter using a soup ladle, and spread evenly into the bottom of the pan. Using the back of a metal spoon, level the surface (add more batter if necessary - I needed about one-and-a-half scoops of a soup ladle per layer). Grill for about 5 to 6 minutes, or until layer is cooked and nicely browned. Remove pan from the oven. Prick a few holes lightly with a fork, and press lightly on the cooked layer with a lapis press (optional) to remove air pockets. Add the next layer of batter (now that you've determined how much you need), spread and level the surface, and grill. Repeat until all the batter is used up. Scatter some prunes on the uncooked batter every 4th layer (i.e. 4th, 8th, 12th layer, etc) and grill as before. As the layers build up and get closer to the top heating element, grilling time will be less, so keep a careful watch so as to avoid burning any layer. For the last 2 to 3 layers, move oven rack one level down. On the final layer, scatter the top with the reserved prunes. Set the oven to 180 deg C (390 deg F) and switch to upper and lower heat. Bake the cake for another 10 minutes before removing from the oven. When done, allow cake to rest in the pan for 10 minutes. Remove from pan and allow cake to cool completely. Trim all around the sides to reveal the layered (lapis) pattern. Slice thinly and serve. Hi Tom, thank you for asking! I generally prefer measuring ingredients by weight as it yields more consistent outcomes in baking. I can only offer a rough estimate of the number of eggs and egg yolks you’ll need, and this really depends on what size of eggs you normally get. On average, 150 gm of eggs would work out to 2 1/2 eggs, and 420 grams of yolks would be approximately 26 egg yolks, assuming the typical egg size yields 56 gm (16 gm yolk, 40 gm white). Hope this helps! Hello Celia I was hoping that you will have a recipe for Christmas fruit cake ❤️ You’re one of my absolutely favourite bloggers ?My mom wants me to bake that for her…..but I can’t find a good recipe ? Hi Grace, pre-heat your oven to 200 deg C (390 deg F). Once the oven reaches this temp, then switch to grill mode before you put in the pan with your first layer of cake batter.? hi, may i know what is the temperature to bake the cake? Hi Celia. I recommend adding 1 tablespoon of Brandy to the batter. Hi Soolee, thanks so much for pointing out that I missed the butter amount! Sorry about that, it’s been added – 500 glorious grams!?? Hi, cake looks awesome. How much butter is required? Hi Min, you can look for mixed spice powder usually available in supermarkets that stock herbs and spices. Also, depending on where you live, there’s something called cake spice that you might be able to find in specialty shops that sell baking products and ingredients, which is specially mixed for making layer cakes like these. I found a useful recipe for homemade mixed spice here, courtesy of Foodmanna, which might be what you’re looking for.? Sponge gel is 海绵胶 (Hǎimián jiāo). Not sure if that’s accurate, but that’s what I got when I googled it ???. Glad you do, Nona! Thank you!? 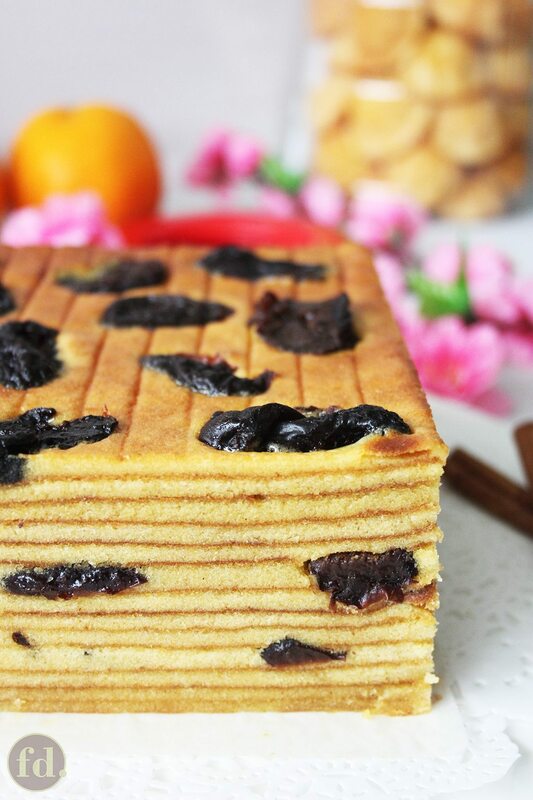 I love this Indonesian Layer Cake. What kind of spices are in this mixed spice? Do you have the recipe for this mixed spice? And what do you call sponge gel (Ovalette) in Chinese (cantonese). Thank you.